very handy and light weight it's perfect to work wherever i go with Ableton Live. Very valuable and fun to play! The included software is super awesome! Plug it in and it just works. Very well built and a very usable controller. Essential. Highly recommend to new producers and people interested in learning music theory/creation. I like it, its beautiful and very portable, I will use it for a long time. The only thing I dislike its that for me, the keys are hard to touch, I mean, I have to push hard to get a high midi velocity and that tires my hands fast. This product is great. I have no complaints, It is as I had expected. Hi! I like to say that the product the LaunchKey Mini Mk2 , is excellent !! and the customer support I have receive is very helpful and nice. I use to get the support very quickly. I have downloaded the stuff and started using the product. everything is as said. I have liked it very much and surly going to produce high quality music.. Even the video tutorials are up to the mark, one can get going very easily.I am using it on windows 10 64 bit on my pc, it is working completely. thanks a lot to Novation & Focusrite team. Looking forward to get more new products. Small, portable, powerful, just good stuff. I dig the colour change on the underside too! Very simple plug and play operation. Everything mapped in Ableton beautifully. Good for a beginner!! 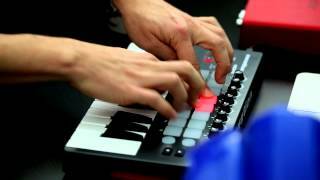 it can control Ableton very comfortable and 16 pads are enough for creating music. I think Launchkey Mini is the best midi controller! I've never been more excited about producing at home ever since purchasing my first midi controller. Learning how to use the Launchkey Mini was easier than expected, with its functions improving my workflow 100%. I've made the most progress i've made in production since starting one year ago. Highly recommend to people who have just started making music, or are looking at taking there art to the next step. This product is really simple to use. Although you may want to have a little bit of knowledge for using Ableton beforehand, you can easily learn how to use it. I recommend this product for beginners as it's basic, and serves your purpose to a certain extent. I can vouch for this, as I am a beginner myself. Also if you are worried about delivery time and are in a hurry, have no fear. Mine arrived within two days and in great condition. No damage or missing parts. If you are skeptical about its portability, don't. It's really portable. I bring mine everywhere. No messy cables, no need to recharge it or anything, so that if you are in a hurry, you can immediately pack it up. Great entry level midi controller, fantastic software package. Delivered promptly. Really pleased! Would definitely recommend Novation to anyone. Excellent introductory product. Easy to set up and has already provided hours of entertainment. I'm really happy with the size of Lanuchkey Mini. It's very interesting to make music with Launchkey Mini. This was looking for my first controller and I am very happy I chose this one. It is cheep, useful, portable, well made and comes with great software. Would recommend. Machine is perfect! It is really lovely. I am sure this machine will push me creating good music! This is my first USB midi controller I own. It is the most affordable and compact controller on the market and great for beginners producer. Im fully satisfied with the service. Highly recommended for new beginner. .. happy to produce new music. Just happy to make new sounds and music. I am falling love with creation novation. Best wishes for new beginners. ..
Really a good product, I really wanted portability and I'm pleased with the Launchkey Mini. It is the perfect keyboard to travel with and can be linked to an ipad with a little help from the tech. dept. The best thing I can say about the mini is originally I bought it for when I am travelling or not in my studio and it is now my studio keyboard...I sold my big midi keyboard as this just fits the bill. Great key feel simple yet usable and compliments my launchpad so well. Love it! For Ableton Live in particular my original model Launchkey Mini gets as much daily use as my QWERTY keyboard. Straightforward modes make it simple to operate by not overloading it with features that would require a display in order to see current states. Features lacking such as pitchbend & modwheel, aftetouch, master channel fader, and arpggiator, tend to be missing from most of the competing products from Akai, M-Audio and others - and where they do have some of those features, lack the tight integration with Ableton Live that all Novation controllers appear to have by default. A brilliant adequate midi controller for any beginner of learning to play play Piano or learning EDM sample looping or patterns. A good price also. Is a very nice compact piece of production, very intuitive and fully workable with ableton! I Love it! As a relative newbie to computer produced music and midi controllers, I wanted something not too complicated or expensive to control Ableton, and give me a keyboard as well, so I went for the Launchkey Mini, and it does the job just fine. Ableton recognised it from the start, and it's very easy to use. Does what it says on the tin! I'll be upgrading to a Launchkey 49 or 61 soon with any luck, they're that good! Recommended. Does exactly what i need it to do. Compact and extremely functional. Accurate responsiveness and super easy to configure with Reason. A truly fantastic, robust and beautiful product. For the price, you can't go far wrong. I use this a a MIDI controller to control Traktor effects and It's just perfect. Love it for FL studio, quick simple and a cheap option. 5 stars! I've been using my Launchkey Mini coupled with FL Studio HD on my iPad. It does everything I need it to do. I especially like the velocity sensitive keys. I am also a big fan of how portable it is. Nice midi controller. Keys are a great size to swiftly move around and the drum pads have a nice feel to them. Great build quality just wish there was more support for more platforms! Very portable and great for on the road work. I just love how the keyboard feels overall with the ability to assign sounds to each pad or with the knobs control some of the effects. If anybody is looking for a great portable keyboard, the Novation Launchkey Mini is one i'd recommend for both amateurs and professionals. Great portability and function for Live. Keys feel fine for mini keys, but don't expect a semi-weighted key feel. Any type of pitch bend & mod wheel inclusion would have made it 5 stars. A little combo bend wheel would be great. Novation's Launchkey Mini has all of the quality and features I need to be creative in my music as well as being portable so I can produce on the go. Launchkey Mini is perfect for sketching out ideas in Ableton Live using its 25-note mini keyboard. Trigger loops and perform expressive drum beats with 16 velocity-sensitive multicoloured pads. Tweak your instruments and effects using the eight knobs. Launchkey Mini will work the moment you plug it into your laptop via USB, or your iPad via Camera Connection Kit. It integrates immediately with Ableton Live or any other major music software, and comes with everything you need to start making music, including Ableton Live Lite. 16 velocity-sensitive multicoloured pads for triggering clips and playing drums. Tweak your instruments and effects or freely reassign using eight high-quality knobs. USB bus-powered and totally class compliant, so it works straight away without any drivers. 25-note keyboard, eight assignable rotary controls, seven function buttons, and a further two performance buttons.